This was my weekend accomplishment. 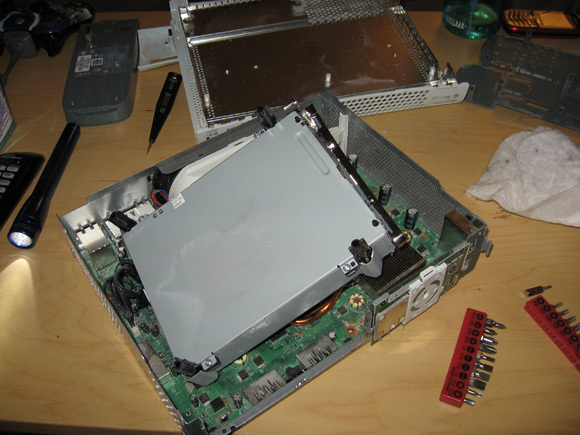 After fearing that I would have to pay upwards of a couple hundred bucks for a new Xbox 360 I decided to do some home repairs. Things went fairly smoothly thanks to helpful advice and diagrams on the internet. The problem was a dirty laser head, which is what I was expecting. All I had to do was lightly rub the laser head with a q-tip a few times. Then I fired it up and the system started reading discs perfectly again. The sad thing is this would cost at least $100 and 2-3 weeks of time if I sent it to Microsoft and they did the exact same thing. The case was annoying, but after taking apart the plastic layer on the outside the rest of the process was simple enough. A gaming console is just a specific type of computer, so if you've ever built or upgraded your own hardware you would feel right at home with the innards of a modern console. If you have problems and are out of warranty like I am, don't be afraid to crack open your case and see what you can do on your own. I really hope this fix will stay, I don't want to have to purchase another Xbox 360.